Greenberg’s Pocket Price Guide To American Flyer Trains 1946-2019 (Paperback) by Kalmbach Books. This essential pocket-sized guide provides accurate, current market values for American Flyer S gauge trains and accessories manufactured by A.C. Gilbert and Lionel. This functional easy-to-read volume is published every other year and also contains ready-to-run S gauge trains from other contemporary manufacturers like American Modelers and MTH. It remains a valuable and reliable source of pricing information. American Flyer Price & Rarity Guide - 2012 Edition (Paperback) by Robert Bubeck. If you collect or are thinking of buying or selling American Flyer S gauge trains and accessories, you need this guide. TM Guides offer more features than any other guide on the market, but their most important ingredient is accuracy. This book contains the most accurate and thorough listing of Gilbert and Lionel American Flyer S Gauge production available. Included are chapters on engines, rolling stock, accessories, sets, and paper. Also included is Flyer production by Lionel through 2011, Book 2. Bob Bubeck is an astute observer of the American Flyer S gauge scene and a life-long American Flyer fan. Bob and his fraternity of dedicated American Flyer experts are careful observers of trends, prices at train shows, on eBay, hobby shops and sales between collectors. Andy Jugle has made a critically essential contribution to an enhanced section on train-related Gilbert paper. This book is the result of painstaking research and educated insight into the current S gauge market. Standard Catalog of American Flyer Trains by David Doyle (Paperback). This book is the ONLY full-color guide on the subject, and serves the needs of toy train collectors who rely on detailed color photos to accurately identify trains. 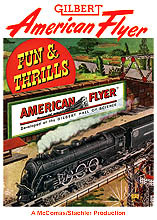 A bargain buy when first introduced as "Chicago Flyer," American Flyer trains rose to premier toy train status in the last half of the 20th century. The company’s claim to fame, the S gauge train, is supported by the prewar wide and O gauge, and later HO scale trains. This 400 page one-of-a-kind guide covers all three groups in extensive detail. 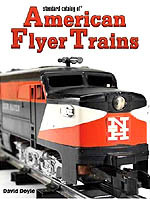 The most comprehensive overview of the American Flyer line, this book follows the winning format of the Standard Catalog line of toy train references. 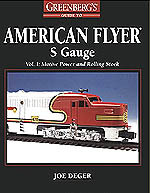 American Flyer S Gauge: Illustrated Price Guide & History 1946-2000 (Paperback) By Robert Bubeck, David Garrigues. As the demand for classic and new toy trains, fueled by a strong economy and internet auctions, has skyrocketed in the last few years, American Flyer trains have surged in value. Written by the leading American Flyer authority in the U.S., this guide examines the post war S Gauge era, including engines, rolling stock, sets, accessories, period ads, and Lionel-built Flyers. Gorgeous color photography is accompanied by full and accurate descriptions and prices, rarity ratings, and TM’s exclusive "trend arrows," which indicate the likely future values of all items. The Man Who Changed How Boys and Toys Were Made: The Life and Times of A.C. Gilbert the Man Who Saved Christmas (Paperback) By Bruce Watson. 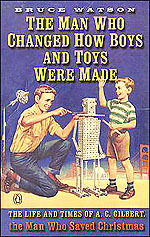 Watson’s brisk biography of Alfred Carleton Gilbert, the inventor of Erector sets, pleasurably evokes a nostalgic corner of Americana. It is no exaggeration to credit Gilbert with creating the modern toy industry (he founded its trade organization and at his peak was the wealthiest toy manufacturer in the country). It is no surprise when Watson emphasizes Gilbert’s marketing savvy. He was part of the product, presenting himself in ads as a boy who never grew up, though his friends, as Watson writes, "found Gilbert about as childlike as your IRS auditor." His business success, according to Watson, in part derived from a society worried about the "boy problem," as mischief making in the early 1900s was called. An athletics craze represented one solution (Gilbert himself was an Olympic pole vaulter), and what better way to occupy idle hands than with an Erector set? With a lively and inquisitive writing style, Watson embeds Gilbert in his times, producing an insightful, fluid narrative. 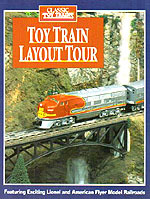 Toy Train Layout Tour (Paperback) By Richard Christianson (Editor). This book is hardly ever in at our 4 county library system. So I bought the last one they had. I made the mistake of giving it "to read and return" to a train buddy. Bad mistake. The variety, workmanship and excellent graphics made this a treasure. Guess I’ll just have to ask my master modeler friend and fellow singer about its whereabouts. Shucks, there goes a perfectly good friendship. In estate planning there is the old, old saying: "Once you give it away, it’s gone!" Gilbert’s Famous American Flyer Trains (Hardcover) By Paul C. Nelson. Gibert’s famous American Flyer trains have made a lasting impression on thousands of youngsters through the years, all of whom now are grown - and many of whom still operate or collect American Flyer. This book weaves a rich tapestry of the history of Gilbert as it chronicles the life and times of American Flyer trains, some of the most beloved toys of all time. This book is 11-1/4" at the spine by 8-3/4" wide, with numerous color and black and white photos. Gilbert American Flyer S Gauge Operating and Repair Guide (Volume 1) (Paperback) By Thomas B. Barker. Tom Barker’s best selling guide to the repair and restoration of Gilbert American Flyer S Gauge trains is available in print once more. Now in its 40th Anniversary, Third Edition it is packed full of new information including a new chapter on cosmetic restoration and an expanded chapter on accessories. Tom includes a handy checklist that gives you the step-by-step procedures for servicing a steam or diesel engine when it comes into your roundhouse. The book’s footprint has been made smaller so more precious space on a workbench is available. At the same time, the type has been made larger and all the Gilbert hook-up instructions have been reset for easier reading. The famous trouble shooting flow diagram has been redrawn and 85 new photographs have been added for a total of 120 close-up, detailed visual insights into how these prized model trains are assembled and serviced. 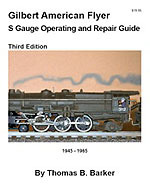 If you are new to American Flyer S Gauge operating and collecting, this is a "must have guide" to your hobby. If you have a previous copy of Tom’s book, you will certainly want to get this new version! 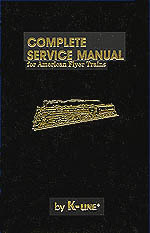 Complete Service Manual for American Flyer Trains (Hardcover) By Maury D. Klein. This valuable reference book is a one volume encyclopedia with definite appeal for all model train fans. From the pages of the A.C. Gilbert service manual come schematic and wiring diagrams, a description of each item, repair and operating instructions for all items, a parts list and a master number index. Additionally, sheets and booklets that accompany engines, operating cars and accessories are included. This hardcover book will stand up to a lifetime of use. About the Author: Maury D. Klein is the president of MDK, Inc, manufacturer of K-LINE Electric Trains. The company produces a wide variety of O and S Scale model trains and accessories and has been serving the hobby market with popular and innovative products since 1974. 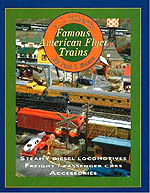 American Flyer: Classic Toy Trains (Hardcover) By Gerry Souter (Author), Janet Souter (Author), Bill Milne (Photographer) This book gives you the complete story of American Flyer trains and competition in the toy train industry. The complete history from the original O and Standard Gauge trains produced by W.O. Coleman and friendship and eventual sale to A.C. Gilbert spans 3/4th of a century. Many of the staff of the original company worked for Gilbert and were influential in the development of 3/16 scale trains. The conversion from three rail to two rail track driven by A.C.Gilbert’s goal to produce the most realistic model trains made. Well written and lots of excellent photos. You won’t find photos of everything the company ever made, but you will find a page turning text that will entertain and inform from cover to cover. Gilbert American Flyer Instruction Book (Paperback) By A.C. Gilbert & Co, A.C. Gilbert Company. This book was originally published in 1952 by the A.C. Gilbert Company and has been reprinted by Bibliographic Press as a quality paperback printed on acid- free paper. It provides extensive information about all aspects of American Flyer trains and is enhanced by dozens of illustrations and charts. It is an essential tool for anyone who wants to (in the words of the old Gilbert slogan) "Make it Real" with American Flyer equipment. Greenberg’s Guide to American Flyer: S Gauge: Motive Power and Rolling Stock Volume 1 (Paperback) By Joe Deger. 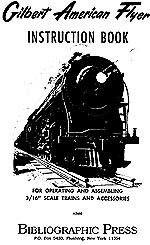 Features a comprehensive list of American Flyer locomotives, motorized units, and passenger and freight cars from 1946-1966. Includes hundreds of photographs, product descriptions, and valuations. American Flyer DVD Director: Tom McComas. Two-hours of great S gauge action. Eight American Flyer S gauge layouts. All different. All interesting  a fabulous Flyer S Gauge mix. Brad Nelson  exquisite scenery. Bruce Manson  a busy, cross-section of both city and country life. Warren Frost  just about every AF steamer, diesel, and accessory in action. Mike Kolleseus  the finest pure Gilbert layout plus those fabulous scratch-built Erector accessories. Bruce Lorence  lots of train and accessory action. Ed Fialkowski’s three-level masterpiece. Terry Dyer  a tribute to an American Flyer Christmas. CAN’T FIND THE BOOK YOU’RE LOOKING FOR HERE? USE THIS SEARCH BOX TO FIND THE BOOK YOU WANT AT AMAZON.COM.